A world of apple diversity? With so much diversity only three varieties make up 80% of production. A century ago, in just one country, Italy, there were 8,000 known fruit species. Now this has decreased to 2,000 species of which 1,500 are endangered. At the beginning of the C19th in Italy, if we consider apples alone, there were 100 varieties cultivated. One hundred years later the number had declined to around 50 and today three varieties make up 80% of production. This significant reduction in the number of apple varieties is prevalent globally. However, enthusiasts are pursuing initiatives to redress this trend. 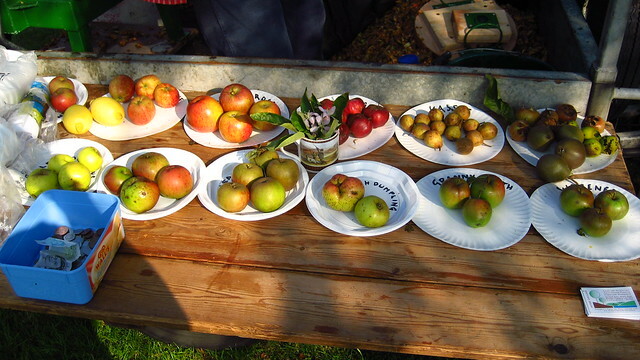 In the USA, David Benscoter has rediscovered the Nero and Fall Jeneting varieties in Washington and John Bunker in Maine cultivates traditional varieties such as the Westfield Seek-No-Further (a small, yellow apple), the red-streaked Wolf River and the Black Oxford (purple and plum like). In Wales, an apple found nowhere else in the world was discovered growing on a single tree on the remote Bardsey Island. This apple, now named as the Bardsey apple, is boldly striped in pink over cream with a lemon aroma and is being cultivated by Ian Sturrock along with other rare varieties such as the Pig Aderyn, Pigeon’s Beak Apple and Monmouth Beauty. It may no longer be possible to find and taste the delights of varieties such as the Yellow Siberian Crab, Shoreland Eclipse, Tower of Glamis and Wren’s Favourite but, returning to Italy, Isabella Dalla Ragione of the Fondatori di Archaeologia Arborea* in Umbria is cultivating once popular but now rare species such as the Muso di Bue and wonderfully named Cul di Somaro.